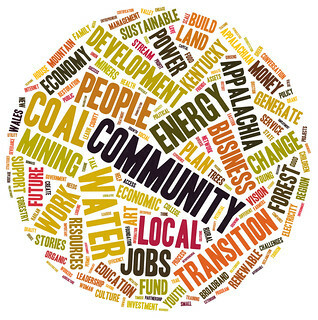 The Appalachia’s Bright Future conference, held in Harlan, KY April 19-22, brought together more than 200 people for conversations about shaping a just transition in eastern Kentucky and Central Appalachia. KFTC is pleased to now make available a large number of videos, presentations, notes, media coverage about the event, suggested next steps, and other documents that were shared or created during the weekend. The collected information can be found here. We appreciate all of the speakers, workshop presenters, artists and conference participants who shared stories and provided important information and perspectives. Even a brief review of the conference web pages makes it clear that this was a pretty extraordinary gathering and conversation. KFTC members and many of our allies in the region are spending time this month reflecting on the conference and developing key next steps. We encourage all KFTC members to bring your ideas and questions to the next chapter meeting in your area. You may also leave comments and questions on the conference web pages. And conference participants are invited to join a phone call on May 30th to discuss ways forward. Together we can build Appalachia’s Bright Future. Two media events Tuesday helped focus attention on the Appalachian Community Health Emergency Act, legislation in Congress that would place an immediate moratorium on new permits while the health impacts of mountaintop removal mining are studied. Known as the ACHE Act, H.R. 526 was introduced earlier this year by Reps. John Yarmuth of Kentucky and Louise Slaughter of New York, who was born in Harlan County, Kentucky. “I’ve talked to citizens in the area – towns were 25 percent of the people suffer from some kind of disease, way beyond the national average,” said Yarmuth in an afternoon Congressional briefing. “I’ve talked with teachers whose students color creeks orange. On Tuesday, a legislative subcommittee will consider again a proposal from Kentucky’s Division of Water to significantly weaken the water quality standard for selenium pollution. Eastern Kentucky's economy is changing fast, and our future is unwritten. We believe we have the opportunity to move forward together, to build a new economy here in the mountains – a diverse, home-grown economy good for all people. We can generate new jobs, new businesses and new opportunities for the workers, families and young people of eastern Kentucky. It won't be easy, but we can have a bright future here, if we build it. We believe it's essential that the transition to the new economy is a just transition – one that celebrates our culture and invests in communities and workers who depend on the old economy. We have many assets here. This gathering is for anyone who cares about the future of eastern Kentucky and Central Appalachia and is interested in a positive, constructive conversation about the challenges and opportunities we face. Please join us whether you are already working to build a more diverse and sustainable economy or simply want to learn more about what a just transition means and ways to move forward together. Don’t delay in registering for this exciting event. Many of the hotel rooms we’ve reserved will only be guaranteed through March 19. You are encouraged to make your arrangements as soon as possible! Our goal is to develop opportunities for our people, for eastern Kentucky, to thrive. We hope you’ll join us for a conversation about the opportunities and challenges we face in our state and region as we work together to build the next economy in eastern Kentucky. The program features positive stories and examples about economic transition from eastern Kentucky and many other Central Appalachian communities. We’ll also hear from invited guests from places that have been through major economic upheaval, including speakers from Wales, the north Atlantic, the Pacific Northwest, and rural Pennsylvania, to name a few. The program has been designed to engage participants in many ways, including through art, music and theater as well as more traditional conference formats. More than a dozen workshops will focus on promising pathways for job creation and community development in areas like renewable energy, land and stream restoration, arts and culture, broadband internet access, sustainable forestry, and energy efficient affordable housing. Additional workshops will explore what a just transition in eastern Kentucky means, and what it will take, from the perspective of journalists, workers, and young people in the region. A primary goal throughout the weekend is to foster an honest, constructive conversation about economic transition. We don’t pretend that we (or anyone) has the answer. But there is a lot we can learn from each other about what’s possible and what’s needed.